A standard set of wine charms consists of 6 wine charms in a small cloth bag, shipped in a 3"x3"x1" box. A typical charm is about an inch in size with a 3/4" wire loop. 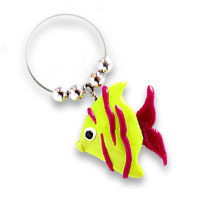 Each charm is carefully handcrafted out of high-quality modeling clay and hardened in an oven. The charm is painted if needed and then glazed with a satin-finish gloss. Finally, the charm and selected beads are threaded onto the wire loop. Each charm is unique, so identical designs may differ slightly from each other. Each bag is handsewn and threaded with ribbon. Bag designs will vary according to your charm choices. Prices vary depending on the number and types of charms selected. A standard set of 6 charms such as the "Wine and Cheese" set is $35. See our price list for more details. In addition to wine charms, Cloud Village currently offers placecard holders, photo holders, breast cancer support earrings, and small statues. More product lines are always possible, so feel free to make a suggestion or request! Prices for other products vary depending on the complexity; we will determine a price at the time of ordering. The charms and other items are durable, yet should be treated with care just like you would treat any delicate object. We recommend that you not immerse them in water or expose them to high heat, and don't put them through the dishwasher. Please don't squash them, bang them against hard objects, give them to small children, or eat them. However, should your charm break under normal use, please notify us and we will be happy to replace it for you free of charge.